The Seafari has appealed to the family man and to those wanting to take extended trips spending their nights aboard the boat. The galley seat, not provided on all Seafari's, has been an accessory in demand when an extra can be found. Owned since 1975, she's an original beauty with an Etec 150 and a Potter bracket. She joined the SeaCraft 21' "Unohu" in many ocean crossings to the Bahamas for fishing & diving in the late 70's & 80's. Now she's enjoyed extensively closer to home and on 1 or 2 week trips thru the inland waterways of Florida making full use of her sleeping cabin and galley seat. As Denny says, "I'd rather be fishing than working". This is Father Frank's fishing buddy, and fourth SeaCraft. After having languished undercoverd under an oak tree for 7 years, it was purchased by Frank's wife, Sharon in late 2001, after years of hearing Frank repeatedly describe his love for SeaCraft, and especially the Seafari. After receiving the boat, he first replaced the wiring the squirrels had eaten, removed all their acorns, and replaced the fuel tank. Then the original 85 hp motor was changed for a 150 Mercury, and then in late 2007, that was replaced with a 90 hp Mercury Optimax. 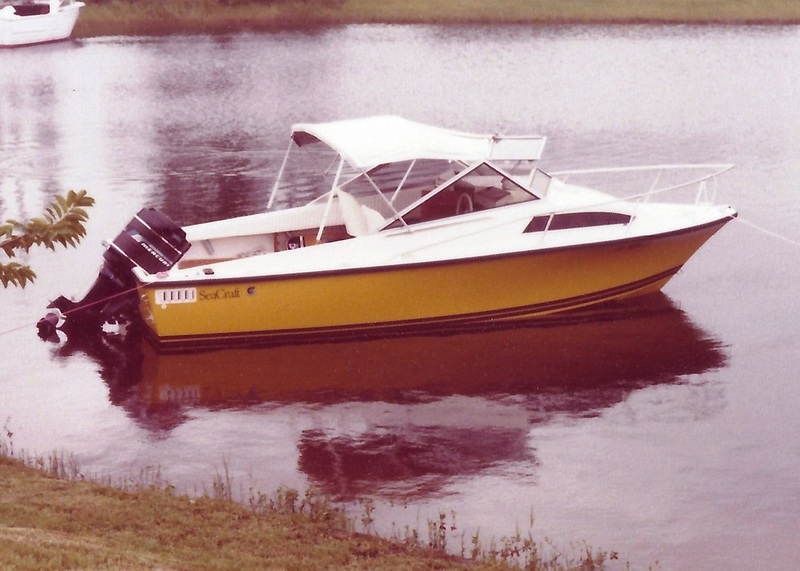 Today it gets used as an all-around family fun and fishing boat, just as it did over 35 years ago, and just as Carl Moesly intended. 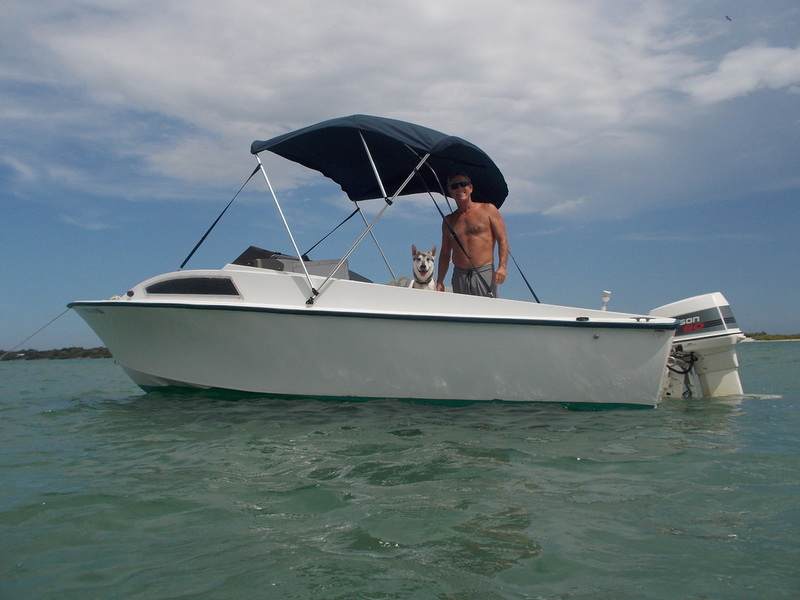 In 2007 I'd taken many long fishing rides in a friend's Whaler 20 and in another's Parker 25. One day beat up by the Parker coming home, I felt like I'd left my kidneys somewhere near Kidney Bank about 35 miles into Mexican waters. After 3 weeks of pain I decided to get a nice riding boat. I determined I wanted a SeaCraft. I noticed a Seafari listed north of Malibu and called. A few weeks later wildfires had engulfed the Mountains and I was hell-bent on saving this one. The fires were out of control and roads were being closed, but I went up the Grapevine looking for the boat. Got there and got her out of the Santa Clara Valley just before they closed the I-5. So now you know - "Therapy" is the cause my sickness. Shes "nimble" like a runabout but feels stout in the slop. Her limitations are the size of her fuel tank. I finished my restore about 3 years ago. I get alot of oohs and ahhs. 56 I own one! Thanks for looking. 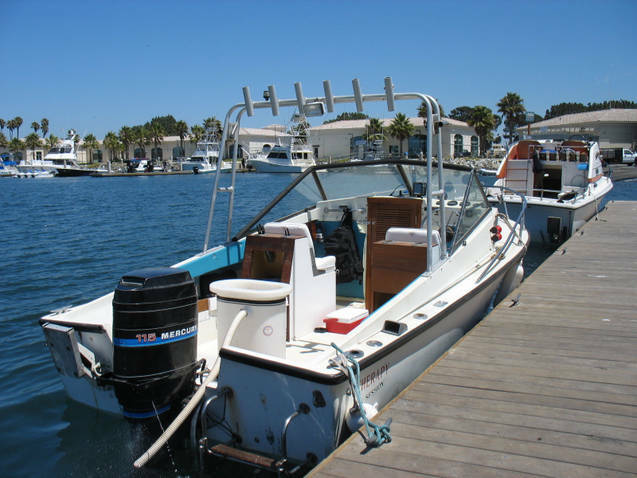 motor-well, outriggers, teak replacement of bolsters, teak platform, GPS speedometer, barefoot boom, and 2012 ETEC 150 HO. On SC lakes she is used for riding, wakeboarding, skiing, and footing. 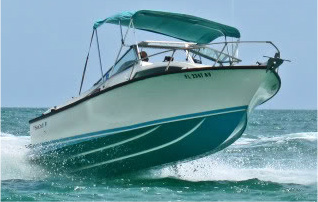 It is fun to tell our South Carolina boat guests this ski boat has caught sailfish, dolphin, wahoo, and lobster too!